Lighting control systems have become more ubiquitous in recent years. Whereas five years ago, sophisticated lighting control schemes were the realm of a few performance venues, nowadays your neighborhood grocery store uses wireless lighting controls that can be complex to calibrate and require attention to detail from design through to occupancy. Commissioning is vital to ensuring that installed equipment operates as designed and provides adequate light levels and indoor environmental quality, and user controls function as intended. Cx Associates staff have previously written blogs about lighting controls; Rick wrote about issues he encountered with LED drivers in 2017 and Brent addressed challenges with user interfaces in 2013. For an introduction, the Lighting Controls Association provides a helpful overview of lighting controls and updates their article as technology changes. The increasing efficacy of light-emitting diode (LED) lighting exacerbates the adverse effects of high LPD allowances. 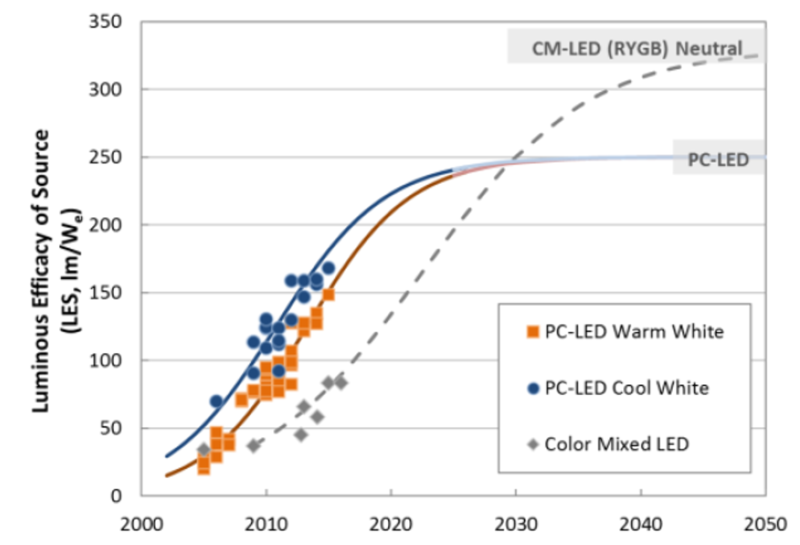 In the Department of Energy’s 2017 Solid-State Lighting R&D Plan, an updated projection for the efficacy of LED lighting (see Figure 1 below) shows that commercial fixtures today are producing 150 lumens per watt (lm/W); efficacy is expected to increase to 250 lm/W by 2035. Figure 1. LED Package Efficacy for Commercial Products. Source: DOE, 2017, "Solid-State Lighting R&D Plan"
High LPD allowances and high LED efficacy can contribute to spaces being designed with more light than needed, even when the LPDs are well below code. Lighting design should be based on illuminance – luminous flux per unit area – to calculate the required light levels for occupant comfort and determine lighting design and controls accordingly. The English units for illuminance are footcandles (lumens/ft2) and the SI units are lux (lumens/m2). The Illuminating Engineering Society of North America produces The Lighting Handbook, which provides recommended illuminance targets for various applications in SI units of lux. Today’s lighting design software applications enable accurate point-by-point illuminance calculations, which can be used to tune the lighting design to provide task/ambient solutions. These design solutions maintain lower ambient light levels and provide higher illuminance levels where available and needed for tasks. Control strategy is a planned set of controls for a system; it generally includes a sequence of operation that dictates how building systems shall operate. Control strategies are commonly used in commercial HVAC applications, but are still relatively new for lighting systems. A lighting control strategy can be defined more easily once illuminance targets are established. For instance, different light level preferences in the same zone may require dimming capability or task lighting, spaces adjacent to windows will require daylight-responsive controls, and open office layouts with diverse populations may need multi-zone dimming control and can often benefit from preset ‘scene selector’ wall switches. Detailed lighting control sequences are necessary to attain effective operation of lighting systems. Without detailed sequences, designers are relying on construction personnel to determine how the lighting system should operate. In my experience doing design review of new construction projects, I find that lighting sequences are relatively rare and, when provided, they often lack the detail necessary to support commissioning. Omissions include failure to address all control schemes planned for the different space types in the project, lack of specifics such as device settings, occupancy vs. vacancy sensing preferences, and associated time delays. The Illuminating Engineering Society of North America (IESNA) recommends lighting commissioning as a quality assurance process that can reduce energy consumption and operating costs, increase user acceptance and satisfaction, and enhance asset value. Their 2011 design guide for commissioning lighting control systems offers best practices for commissioning activities in the design, construction, and occupancy phases. The IESNA notes in their commissioning design guide that “the term ‘commissioning’ may be used synonymously, but erroneously, with manufacturer startup services.” On a recent lighting retrofit project, the electrical contractor encountered issues with configuring smart TLED lamps with 4-level wireless wall switches, and, in response, the lighting fixture manufacturer volunteered help to resolve the problems by ‘commissioning’ the system. Commissioning lighting control systems goes far beyond initial setup, and functional testing of equipment is an integral part of the work. For our retrofit project, we found it very valuable to install a prototype. This allowed us to functionally test a small area, discover and rectify issues early, and develop an improved strategy to implement for the full fit-up. 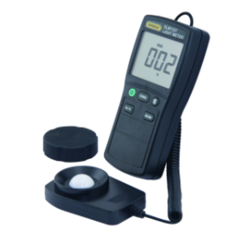 We verified occupancy sensor operation, tested wall switches, and measured light levels using a light meter (see Figure 2 below). Comparing recorded illuminance readings with our design targets, we determined that the maximum light output of the fixtures needed to be permanently tuned down to minimize over-illumination which was an issue with the pre-existing lighting system. We also determined that adjustments were needed to the output of the different dimming settings of the multi-level wall switches. In today’s projects, wireless fixtures are configured using IR technology and apps on smartphones or proprietary remote controllers made by the manufacturer. To tune down fixtures made by one manufacturer, our project team developed a familiarity with the fixture manufacturer’s app using a combination of published user manuals and trial and error. To resolve programming issues for a wireless switch made by a different manufacturer, the electrical contractor needed a remote controller made by the switch manufacturer to set up groups of fixtures and link them to wall switches, which required additional training time for the installers. The learning curve for these tools can be steep, especially for professionals less familiar with apps and wireless technology. On our project, the value of commissioning is apparent. Without proper commissioning of the retrofitted lighting fixtures and controls systems, the building owner would have been left to make their own adjustments and troubleshoot controls issues, which are not always straightforward. With the project team’s effort guided by our third-party commissioning perspective, this project will function as desired, ensure persistent energy efficiency savings for the owner, and provide a high-quality indoor environment for building occupants. In my next blog, I will cover another important lighting controls topic: methods for ensuring lighting control system operation is understood by building occupants and facilities staff. What experiences have you had with designing, installing, and/or commissioning the latest lighting controls systems? Please share your stories below.